When we buy something expensive, it’s hard to rationalize not spending just a little bit more to ensure the safety of the purchase. After all, at a certain point, a little extra money going out the door to ensure longevity and functionality is a no-brainer. Smartphones are a perfect example. There aren’t many people dropping hundreds of dollars on the newest iPhone without getting a case to protect it from scratches, gouges, and drops. Not only that, they represent an opportunity to customize the phone’s look, make it easier to hold, or even extend battery life. For a small percentage of the original product’s price, you get a better-protected product with a more enjoyable experience. What that add-on amounts to is an enhanced and extended experience with your purchase. At this point, you’re probably wondering what the heck a phone case has to do with foam and bedding! The answer? A lot, surprisingly! Think about how important your phone is to your daily routine, and how often you use it. Both would receive pretty high marks, right? Now, measure that against your mattress. First off, your mattress is the biggest factor in your ability to get a full night’s sleep, which provides you with energy throughout your day and boosts overall wellness. And if you’re getting the usually-recommended 8 hours a night, that’s 1/3 of your day, spent in your bed! Even the most die-hard phone addict is unlikely to log eight solid hours of use in a day even once or twice, let alone every day. Lastly, there is the cost. Phones set people back a few hundred bucks usually, more if they buy them outright or “out of contract.” Quality mattresses typically start for as much as a quality smartphone, and the premium ones can get up into the thousands. Considering a mattress in this way, buying the equivalent of a phone case for it starts to make pretty good sense, huh? 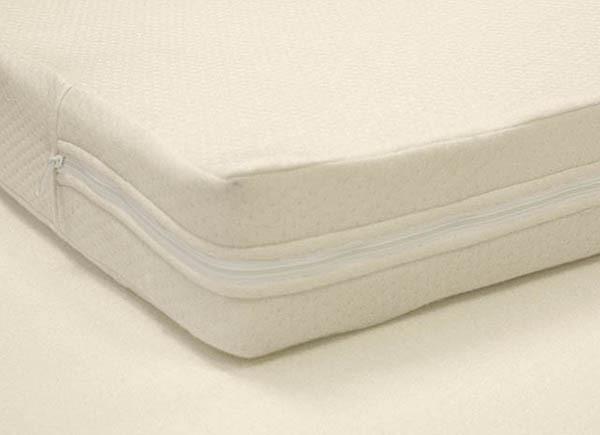 Because of the importance, benefits, and additional value mattress covers provide, The Foam Factory has recently added another product to their mattress accessory line: the Poly-Cotton Knit Cover. Formerly, we’ve only carried a gray and white striped ticking-style cover, and another optional Terrycloth Cover. Now, with the Poly-Cotton Knit Cover option, customers have even more options for protecting and enjoying their bedding purchases. Implementing a mattress cover makes sense for a few reasons. At the top of that list is the protection it offers that’s vital for maximizing the lifespan of your mattress. It helps minimize wear and tear, friction, and is an extra layer of protection against accidents and spills. Of course, covers can add comfort as well, and the Poly-Cotton Knit Cover provides a smooth, soft, cooler-feeling material that’s great atop foam bedding. Ultimately, it’s smart to keep in mind what’s really important in your life, even if it’s easy to overlook something. If you’re not sleeping well, virtually every other area of your life will be negatively affected. Once you get a mattress that helps you get great sleep, it’s only smart to make sure it lasts as long as possible. Adding a mattress cover, like the Poly-Cotton Knit Cover, under your sheets is an easy, affordable, and effective way to get a little more life out of a bed you love.